This water based tire dressing is great for your tires and makes the rubber look bold and distinct. The glossy looking rubber contrasts the shine of your wheels to create an eye catching appearance. This formula uses no solvents or VOC's and it's specially designed to nourish and condition rubber. The formula is actually absorbed in to the rubber which ensures it doesn't sling on to the paint. The water based formula also prevents browning and cracking that many other generic tire dressings can cause. It can be used on virtually any rubber of vinyl surface so it's great on tires, exterior trim, engine bay and so much more. Just spray it directly on the surface or on an applicator/towel and wipe it on the surface. One very light coating will last extra long and make the tires look great for weeks to come. 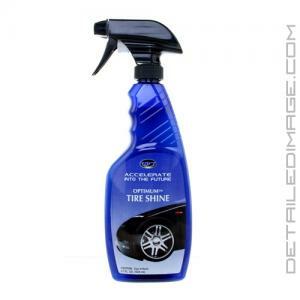 Use the Optimum Tire Shine formula today and you will be thrilled with the dark and glossy shine it adds to your tires with ease. 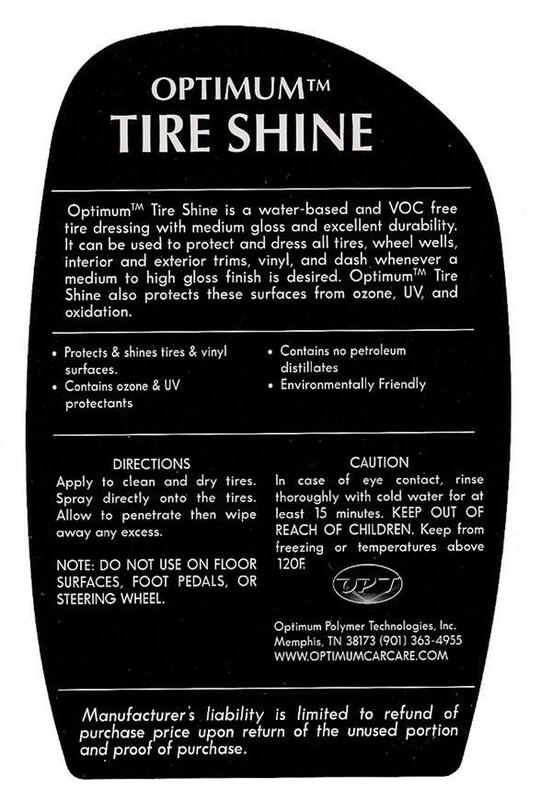 Optimum Tire Shine is a water-based and VOC free tire dressing with medium gloss and excellent durability. It can be used to protect and dress all tires, wheel wells, interior and exterior trims, vinyl, and dash, whenever a medium to high gloss finish is desired. Optimum Tire Shine also protects these surfaces from ozone, UV, and oxidation. Protects & shines tires & vinyl surfaces. Apply to clean and dry tires. Spray directly onto the tires. Allow to penetrate then wipe away any excess. Advertised as a spray. Not at all, very thick! You need to put on with a applicator. The product works well and looks great. This a really good product. I have been using Adam's VRT for years now and this is a close 2nd place. It goes on easy and I actually believe I put too much product on. I had some slinging on the wheel wells after application. A little goes a long way and I will cut back application next time around. Winter time here in Chicago and my tires still look good after 1 week. Nice dark matte finish.